As a retired public library employee, when the “The Last Librarian” by Brandt Legg appeared on my Book Cub list I knew I had to read it. And I wasn’t disappointed. The novel takes place in 2098, 70 years after the Banoff Pandemic wiped out more than half the world’s population and the war which decided how the remaining population would be governed. The Aylantik Government rules the whole planet and everyone is happy, healthy and employed. Or so it seems. 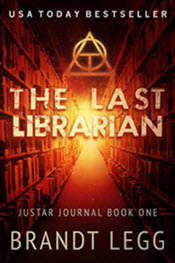 The story begins with Runit, the head librarian at the last library on earth. All printed matter is now digitized and accessible on one’s INU (Information Navigational Unit); therefore, there is no longer a need for the actual printed matter and all but this last library have been destroyed. Runit has just received a message on his INU that his library would be closing in 10 days. He’s sad of course, but he knew it was coming. His library was one of the last three and the other two had been closed in the last year or two. All books and buildings had been destroyed. A patron, Nelson, comes in to write at the library as he has for years. He’s a famous author and has become very close to Runit, so Runit tells him about the closing of the library. Nelson is agitated not only about the loss of the library, but he has some other information for Runit. Someone is changing the digitized books. In one of his own books, a single letter was changed which made the meaning completely different from how it was written. Runit shrugs and says it’s probably a typo, but Nelson asks him to access the book “The Hunger Games” and instead of a novel about teenagers fighting each other for their lives… it’s a cook book. Nelson and Runit realize the books must be saved. But they only have 10 days and there are over one million books in the library. How their mission is accomplished is an exciting and dangerous story full of intrigue and passion for the books, the people involved, and the future of humanity.